A puff of smoke and a whiff of something burning is how most boats fires are first detected. Sometimes detection is far more sudden like when gasoline fumes build up and combust such as an engine room fire or a fueling mishap. Regardless of how a fire aboard starts and is detected, observations from our day of conducting staged boat fires emphasized the need for having a plan should a fire break out. This plan should include having more than the number and type of fire extinguishers required, showing your crew where onboard your safety equipment is and how to use them, and finally, demonstrating the proper and effective procedure for placing an emergency call. Conducting three staged boat fires was no easy task. It involved a team of boating safety experts and accident investigators, as well as dozens of trained fire fighters with a variety of professional backgrounds. 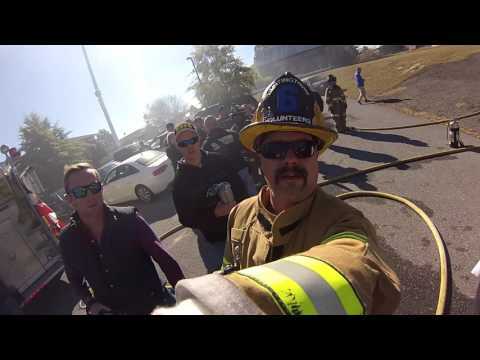 Our staged event took place on terra firma on a fall day at the Huntingtown, MD Volunteer Fire Department. With safety top-of-mind, BoatUS Foundation staff met with Fire Department officials to be certain our event was as realistic as possible and that we captured the fiery moments on camera. Countless hours went into rigging the boats so they were representative of an electrical, engine room and a galley fire. Among the goals for the day were to demonstrate how quickly fires spread and to stress the importance of prevention through maintenance. It gets bad quickly: In each fire, you’d have three or four minutes – to make a VHF radio mayday call, locate and use extinguishers, don life jackets, and prepare to abandon ship – before likely being forced overboard. DSC - Having a working VHF with digital selective calling is critical. DSC messages provide coordinates, so anyone aboard can summon help and give rescuers your location by pressing the radio’s red distress button. A waterproof handheld VHF with DSC is a smart idea as well, because in the event of a fire, an installed VHF will probably lose its power source quickly or be inaccessible. Fire Drill - Do your guests know how to use the radio? The location of the fire extinguishers? Do they wear or keep life jackets close by? Do they know how to shut off the electrical system quickly? A five-minute guest briefing improves fire safety. Water Drill - Beyond flotation and waterproof handheld VHFs, personal locator beacons, flares, and other signaling tools provide a lifeline from the water. Fire Extinguishers - How many do you carry? Are they accessible in seconds? Are they rated ABC for all fires? Having several ABC tri-class extinguishers that go beyond the minimum U.S. Coast Guard requirements could save you and your boat. Built-In Support - An engine-compartment fire-suppression system or, at minimum, an installed engine fire port into which you can discharge fire extinguishers can both contribute to the quick extinguishing of a fire, or at least buy you time in your fight against an engine-room fire. PASS - Follow these four steps when using a fire extinguishers: Pull the safety pin. Aim the extinguisher at the base. Squeeze the handle. Sweep the hose from side to side while discharging. Life Jackets - Many boaters bury them among the gear, then waste precious time locating them in an emergency. Regulations say that if jackets are not worn on board, they must be readily accessible. Exit Route - Are you get out of the boat if the exit is blocked by fire? Carpet, headliner, cushions, curtains, and other flammables ignite when introduced to an open flame. Power of Prevention - Are your electrical and fuel systems maintained to American Boat & Yacht Council (ABYC.org) standards? Electrical faults are the No. 1 cause of boat fires. What’s the condition of your fuel lines? If they’re 10 years old or emit a gas smell from a rag rubbed down their length, replace them. Refueling - How many minutes should you wait to start the engine after filling up at the fuel dock? Answer: At least four, with the blower on and windows and doors/ hatches open for the entire time. End the four-minute period with a sniff test. The first fire was set aboard a small, outboard-powered center- console, Habanero, with the “electrical” fire starting inside the console. 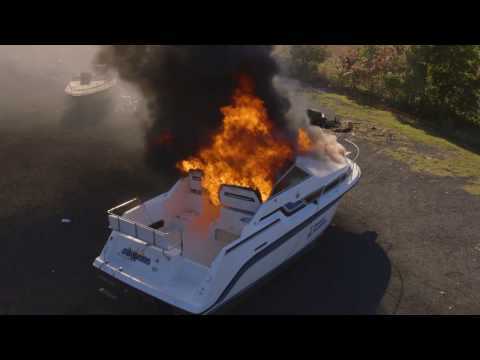 Of all of the boats torched in the name of boating safety that day, the 16-foot fishing boat with outboard motor best showed that there is no truly no place to hide on a small boat. Just four minutes after ignition, smoke turned from white to black as flames rolled out from under the wheel, threatening anyone who remained aboard. In less than 10 minutes, the heat was so intense that the boat’s aluminum rail melted into a puddle, along with a cooler and a 10-gallon external plastic gas tank. The fishing boat had no enclosed compartments and was equipped with an external gas tank, so there was no mandatory requirement to carry a fire extinguisher. This means that buckets of water would have been the only hope for extinguishing the blaze before it rapidly grew out of control. Next, a fire was set aboard a typical inboard/outboard-powered cuddy-cabin 23-footer, Cayenne. An electric match set upon a small amount of gasoline ignited a spaghetti-like shredded-wood product called “excelsior,” which stood in for the inboard motor, much in the way fuel and oil would contribute to an enginecompartment fire. For engine room/ compartment fires, the first sign is often smoke coming from an engine vent or hatch. The boat may still be fully operational, so your first instinct may be to open the hatch to see what’s happening. Don’t! That blast of oxygen delivers fuel to the fire. After our “engine” caught fire and flames swelled when the hatch was opened, it was too late to put out the fire. Four minutes from ignition, the only safe spot on this boat, and for only a few moments more, was the bow deck. Two minutes later, as temperatures soared and flames licked forward between the helm seats, the boat’s windshield shattered. Trained firefighters lit the galley window drapes of the biggest boat, Jalapeño, a 25-foot inboard/outboard-powered cruiser, with a flare, simulating a typical cooktop fire. After just three minutes, heavy black smoke at the helm of the cruiser left that location a questionable place to survive. Four minutes later, the entire boat was fully engulfed. The crew’s only option would have been to jump overboard. There’s no requirement for recreational vessels to be equipped with working smoke detectors or alarms, even though each of these fires burned undetected for precious minutes. The amount of black smoke that emerged from each fire was huge. The National Fire Protection Association recommends smoke detectors on all boats 26 feet and larger with sleeping areas. However, smoke detectors are important to have on all boats, whether they have a sleeping compartment or not. The BoatUS Foundation would like to thank the volunteers of the Huntingtown Volunteer Fire Department.